Dark Horse Comics is proud to reveal the new edition of the House of Night graphic novel from best-selling mother/daughter duo P.C. and Kristin Cast’s vampyric House of Night prose novel series! The new edition of Legacy: A House of Night Graphic Novel features a gorgeous new cover by Joëlle Jones and a new foreword by Kristin Cast. Legacy: A House of Night Graphic Novel features an all-star slate of comics creators. Fish in a Barrel writer Kent Dalian teamed up with P.C. and Kristin to compose the House of Night graphic novel series. Lady Killer creator Joëlle Jones lends her breathtaking illustrative skills to the series as the primary artist with an impressive roster of artists teaming up on issues: Karl Kerschl (Adventures of Superman), Joshua Covey (Freelancers), Daniel Krall (Naughty Mabel), Jonathan Case (Green River Killer), and Eric Canete (Runlovekill). 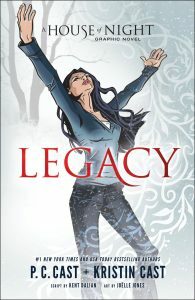 The Legacy: A House of Night Graphic Novel follows the events of the first novel Marked. Zoey Redbird was an average teenager worrying about grades, boys, and breakouts. But priorities change when you’re marked as a vampyre. Zoey leaves her religious family to enroll in the vampyre academy House of Night, which mixes the all-too-familiar high school problems with elemental magic, as well as the physicals changes that accompany a craving for human blood! Zoey and her group of devoted friends turn to The Fledgling Handbook, a historical vampyre tome, to better understand their place this big, new supernatural world. The Legacy: A House of Night Graphic Novel goes on sale May 30, 2018 and is available for preorder on Amazon, Barnes & Noble, and at your local comic shop!